The filming of the first Barney Thomson novel, THE LONG MIDNIGHT OF BARNEY THOMSON, is finally underway in Glasgow today, directed by Robert Carlyle, and starring Carlyle, Ray Winstone and Emma Thompson. There was confirmation this week that the movie will be distributed in the UK by Icon Films. 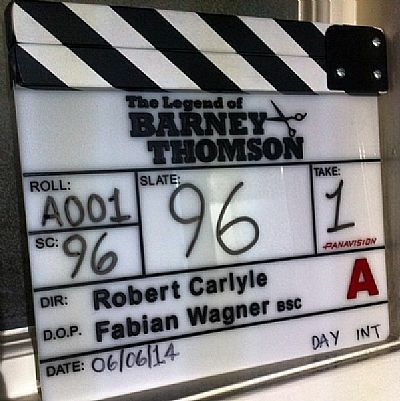 As you can see from producer John Lenic’s photograph from this morning, the movie will be titled THE LEGEND OF BARNEY THOMSON. It’s been a difficult road for the filmmakers, and an even longer one for Barney. I wrote the book about nineteen years ago this summer; the film rights were first sold, to another company, in November 1998, three months before the book was published. It’s been a long lonely highway from there to here, an early highlight being the time when one of the original producers came up with the batshit crazy idea of having Robin Williams play Barney, because he’d heard he wanted to make a film in Scotland. I doubt the script at the time ever got anywhere near Robin Williams. Film people throw names around like torn up pieces of newspaper in the wind, stuck in an eternal loop of fantasy casting, so when Robert Carlyle was first mentioned in relation to the project it sounded great, but kind of too good to be true. Yet, four years later, more or less, here we are. He stuck with it, and now Barney is his. Up until now the old barber and I have co-existed in almost total obscurity. This is the point when Barney shoots ahead and becomes far more well known than his creator. Good luck to him, and all who sail in him.